Religious Zionism was claimed to be on its death bed according to Rabbi Dr. Shmuly Yanklowitz. His article is somewhat disingenuous as he makes it sound like he was born and still resides in Eretz Yisroel with his being younger man living in Efrat and having joined his brothers and sisters to create a human chain stretching from Jerusalem to Gaza. It is not until late in the article he mentions that he has left Eretz Yisroel and now is an Open Orthodox Rabbi living in the United States. His claims about the problems with the Religious Zionists in Eretz Yisroel are actually easily understood by any Olim who resided in the United States and because of their intense Zionism came to Eretz Yisroel to live. He has adapted to his new home and this has caused him to have clouded vision. Please allow us to explain using our experiences after having come here to our little nest in Eretz Yisroel. It is a story about having gone in the opposite direction from Rabbi Dr. Shmuly Yanklowitz. The first confession we need to explain is that despite being Zionist, we had little connection to Judaism despite having been born into a Jewish home. This home went from Orthodox to Reform Judaism before we had reached Bar Mitzvah age. Our connection to Judaism was restarted due to a death in the family. Still, our return was to a Conservative Synagogue as that Synagogue’s Rabbi was a better fit from the Reform Synagogue. The odd thing is the Conservative Synagogue services were very similar to the Reform we knew in our teens. It was coming to Eretz Yisroel where we were actually introduced to Orthodox, a Traditional Sephardi Orthodox Synagogue. This Synagogue has a mix of every form of Judaism in the congregants from Ashkenazim to Sephardim to Jews from India and throughout the Middle East, North Africa, Europe and North America with the main numbers from Romania. Needless to say, we found a flourishing and very colorful mix of Judaism and Jews and we are all friends and as a family. We still have much to learn about Judaism and Torah and the other major writings from the Rabbis over the ages. This experience has strengthened our Zionism and we have joined a political party which supports religious Zionism and every form of Zionism is practiced by the party members, again a mixture of every kind of Jew from every corner of the globe. For one of us it feels so much like home as their mother was an Iraqi Jew raised in Bombay, India and father was a British Jew from London, England with Ukrainian and Prussian ancestry. Yes, we have a rich mixture there as well. Where our making Aliyah was due solely to Zionism, the religious part of our beliefs has truly begun since arriving in Eretz Yisroel. Can we yet claim to be Religious Zionists, well, probably not yet. Are we working in that direction, yes. But Rabbi Yanklowitz makes complaints with which we are very familiar. His complaints are purely leftist American centric complaints. His complaints center around the central tenets of the far left of the Democrat Party. This is to be expected from one who practices Open Orthodoxy which is actually another way of saying Reform Judaism, as their beliefs are very much similar. These Jews follow the socialist wealth redistribution and the minority rights over everybody else’s rights. They believe that borders are not real lines between nations and sacred as they want anybody crossing any border to have full rights in their new nation. This was exemplified by his problem with Israel’s desire to deport the illegal immigrants from Africa who only came to Israel for economic reasons. But as Israel is a wealthy nation, Rabbi Yanklowitz believes that anyone who arrives from a poor nation has an economic right to the better life in the wealthier country no matter the problems and threats to their presumed new nation they may pose. The only thing we would like to tell the good Rabbi is, if you desire the leftist utopia which you envision and likely find the United States currently lacking with President Trump, perhaps you would be best to live in a real socialist utopia like Cuba, Venezuela or North Korea. But you probably are too attached to your wealthy life in the United States where you can criticize Israel of not being that socialist utopia you envision will ultimately save the world. We know the crime Israel has committed is choosing to move from its socialist roots to a capitalist economic model and make it work. Let us set your mind at rest on one subject, the people of Israel give more to the needy than can be measured as most of this assistance is given by one Israeli to another without any need for the government to enact welfare and other forced charity. The charity in Israel is beyond measure because there is no need for the government to take from one Israeli and give to another because the Israelis are perfectly capable of performing this deed on their own. Until you decide to leave your comfortable palaces in the United States, and we realize here in Israel our homes are necessarily smaller and we adapted, and return to Eretz Yisroel, then work to make the United States that perfect land as you have stated that the Diaspora should be the great place for the Jewish People. We disagree and we further promise not to tell the United States how to run their business and you can promise not to attempt to foist your politics upon us. 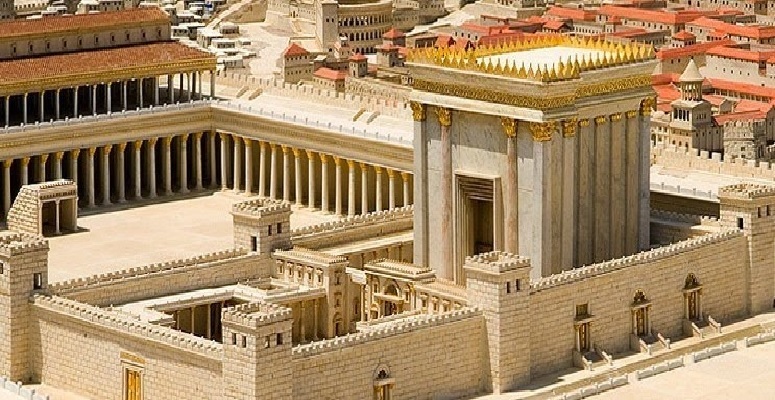 And what we realize from your other writings is that you do not view the Temple as a positive thing while we see the building of the Third Temple as probably the greatest event we have yet to undertake. As our text translates in our morning prayers, “May it be the will before you, Hashem, our G0d and the G0d of our forefathers, that rebuilt shall the Holy Temple be speedily in our days.” We would like to thankyou for your impatience. Let us first speak about the misconception that Israel was founded by Europeans as an apology for the Shoah, the Holocaust. The idea and beginning of the Mandate given the British to establish the Jewish State began during World War I and was part of a series of peoples returning to their ancient homelands. The Arabs had been promised lands and numerous tribal leaders were promised to have the rule over lands and there were promises to many Balkan nations and across the entirety of the MENA States. * These regions were divided up and were to be established by different nations who were amongst the victors of World War I. The nations from Europe established colonial governments which tied these nations to their European nation and were eventually granted independence and Israel was amongst those nations declaring their independence mostly after World War II (see map below). Surrounding Israel, who declared their independence on May 15, 1948, we have other nations who also declared independence with Jordan in 1946, Lebanon in 1946, Syria in 1946, Egypt in 1922, Saudi Arabia in 1932 and Iraq in 1930. 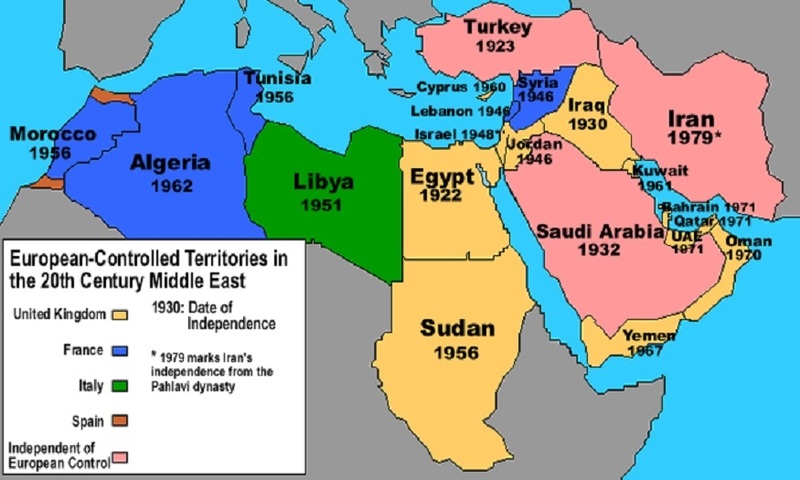 Looking at the map, we see there were other MENA States whose independence was after Israel such as Libya in 1951, Yemen in 1967, Algeria in 1962, as well as Bahrain, UAE, and Qatar all in 1971. So, Israel declared her independence in the second wave but there was a third wave which came much later with all having reached independence by 1975 with Iran having gone from the Pahlavi Dynasty which was Persian rule to the Mullahs which is Islamic Theology in a coup which occurred in 1979. Iran was never held as a colony by the Europeans as they did not take part in World War I and were never subdued and conquered by the Ottoman Empire. There is another map of the MENA States which shows a different reality which many either have never known about or have ignored as it breaks with their preferred notion of Israel as a purely European peopled nation with none living in Israel from outside Europe and North America. That is a falsehood which need be eradicated from the conversation of the Arab-Israeli conflict and the realities. 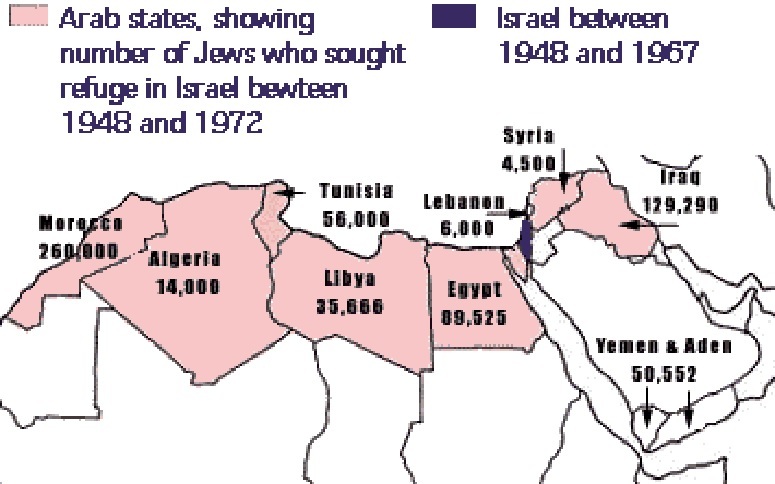 The reality was that by 1960 the population percentage of Jews expelled from Arab nations made up between thirty-five to forty percent of the Jewish population in Israel. As time has continued, with the Aliyah of the Ethiopian Jews brought to Israel in three operations named Moses, Joshua and Solomon, and the Aliyah of the Bnai Menashe from India, the numbers of non-European Jews has reached close to fifty percent if not over half. Further, there has been a fair amount of mixing through marriage with Ashkenazi Jews and Sephardi Jews as well as Mizrahim, Bene Israel, Bnei Menashe, Cochin Jews, Bene Ephraim, Ethiopians, Yemeni, and other even smaller populations all within Israel with others coming from places which stretch the imagination even to include from Japan, China and the Philippines. The world must disabuse themselves of the misconception that Israel is simply a place where the European Jews fled and are still fleeing from Europe, Russia, North America and the Ukraine. The Jews from many Arab nations across the width and breadth of the MENA Nations did not flee; they were expelled by threats, pogroms, expulsion where they were forced from their homes which they had held for some thousands of years and most many hundreds of years. They were denied taking their wealth and their businesses were left to be spoils for the Arabs as well as their homes, farms, herds, jewelry, money and anything else of any worth. They often were allowed one suitcase each which were searched and anything within the searcher desired, they took. These Jews landed in Israel next to destitute with their skills and nothing more. Israel in the 1950’s was not the economic powerhouse she is today; she was a farming economy which did not even have sufficient housing for these over half a million Jews. These Jews were refugees which outnumbered the Arabs displaced during the 1948-9 attempt by six Arab armies to destroy Israel in her cradle. The difference is the Arabs placed their brothers and sisters displaced by their war to annihilate Israel that failed, though they did take control of Gaza and regions of Judea and Samaria which Jordan renamed West Bank, placed them into camps and refused to permit them to work, own land, vote, have citizenship or anything resembling a normal life while the Jews who were expelled and came to Israel were given homes and accepted into Israeli society and treated as any normal society treats their kinfolk. That is why there are Palestinian refugees and not MENA Jewish refugees also in equal numbers in camps. If the Arabs would treat their brothers and sisters as family as Israel did their refugees, there would be no problem. But the Arabs demand that there be a problem and that Israel is to blame, refusing to accept any responsibility themselves. Still, the constant BIG LIE is told over and over and over until the world has come to believe and repeat as if an actual known fact that Israel is a European Colony and has no history or reason to be in the Middle East. This BIG LIE ignores the half of the population in Israel which has at least one parent whose lineage comes from other than Europe, Russia, Ukraine or North America. This must be corrected and the reality is that first, even the European Jews have a genetic link to the Middle East and the other half of the population is from the Middle East or North Africa. Half of the Israeli population originates from the Arab and Islamic world where they resided for centuries upon centuries. They had times where life was very good and they were treated almost equally and there were times when they faced pogroms and forced conversions and even times they were forced to flee the persecution of one area leader and reestablish themselves under a different Sheikh or Mufti where they would be treated better. Often the position of Dhimmi was the best the Jews could hope to find. Many of these Jewish families had histories which went back in their location to the time of the Caliphs and the Islamic conquest and back before Islam with some residing in what became the Arab and Muslim world even before the time of Jesus. We know this because of writings from the Talmud and other Jewish texts and historical writings. Additionally, there have been Jews living within the Promised Lands since the establishing of the initial conquest by Joshua. These are Jews mostly from the tribes of Judah and Benjamin and the Priestly classes of Kohanim and Levites. 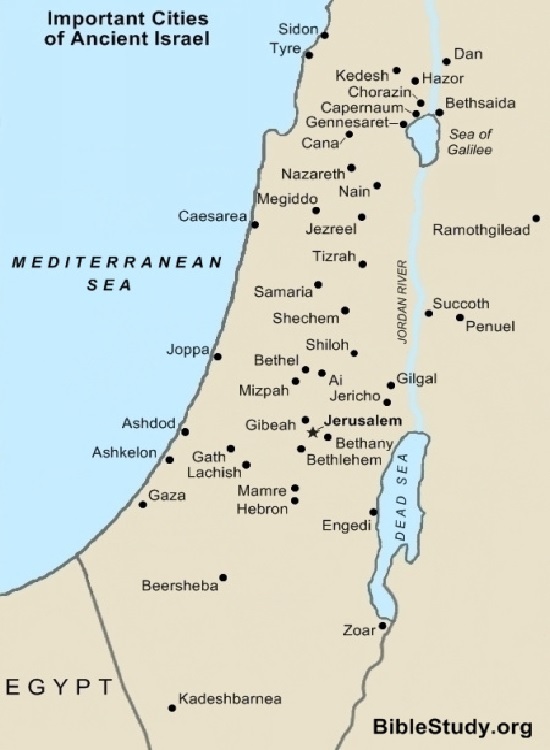 The main cities where these Jews lived included Jerusalem, Hevron, Shechem, Ashkelon, Ashdod, Beersheva and the other ancient cities of Eretz Yisroel (see map below). These Jews which were expelled from the Arab World were almost as numerous as were the initial influx of European Jews by around 1955. This is the truth which the world ignores when they demand that the Jews simply return to wherever they came. Let’s imagine the Jews trying to return to the place they originally came from. Well, if you track the Jews back through their family tree say to around 1000 B.C.E., then you will find that their family origins is in the holy land as ruled by King David. Jerusalem has been conquered and is the capital city and declared to be the Eternal Capital of Eretz Yisroel. This was the beginning of the Israelite empire which eventually reached the Euphrates River in the area which is northern Syria near Iraq (see map below). This was the highpoint in the history of the Jewish People which then divided when the Northern Ten Tribes refused to accept the son of Solomon as King and broke from Judah which then established the northern kingdom of Israel and the southern kingdom of Judea. Israel fell in 722 B.C.E. to the Assyrians and the people were assumed to have assimilated and all but disappeared. Judea fell in 597 B.C.E. to the Babylonians leading to the Babylonian Exile which ended when Persia under Cyrus the Great conquered Babylon and bid the Jews to return and rebuild the Temple and worship Hashem in their custom but were required to pay a tax to the Persians as their rulers with Judea being a province. Eventually came the Romans who, after the Jews had revolted and thrown off Roman Rule twice, decided to disperse the Jewish People throughout their empire as was the Roman method of destroying a people removing them from history. This was how the Romans dispersed the Carthaginians after the Third Punic War. We wish all the best of luck in finding any Carthaginians in the modern world. The Jews only survived because, though our religion is based on our ancient lands and Jerusalem and the Temple, it is also centered on the Torah and the rules it gives us in the form of six-hundred-thirteen Mitzvoth, rules by which to live. This provided the core of the Jewish People for close to two-thousand years along with the knowledge that Hashem promised that we would be returned to our homelands miraculously and our dispersal and exile would end. The promise gave a date according to Ezekiel who said the Jews were to be punished for 430 years because they had turned away from Hashem. This was to become the Babylonian exile. The Persians under Cyrus the Great defeated the Babylonians and freed their Jewish captives about 70 years after Judah lost independence to Babylon. This left 360 years which the Jews would require a second exile to fulfill as one must pay Hashem when one strays. In Leviticus 26:18, Leviticus 26:21, Leviticus 26:24 and Leviticus 26:28 the Torah spells things out quite clearly, should the Jews not fully repent their sins they would be punished increased by a factor of seven. Since most of the Jews freed from Babylon decided to live in the Persian society and adopted pagan ways, which is not exactly repenting, their remaining 360 years were multiplied by seven meaning their time in the Diaspora or under foreign occupation became 2,520 years on the original lunar Jewish calendar which translates to 2,484 years. Count from 536 BCE forward 2,484 years and you arrive at 1948. Further, Isaiah’s prophecy Chapter 66:8 states: “Who has heard of a thing like this? Who has seen things like these? Will a land be brought forth with labor pains in one day? Or will a nation be born at one time? For Zion has come into labor pains as well as given birth to her sons.” Israel was established exactly as Isaiah prophesized in a single day. These are just two prophesies which predicted the return of the Jewish People and the reestablishing of the state of Israel. There are a whole series of prophesies which tell of the future of Israel and the events which will transpire. A partial list can be found here. We figure this would be a great place to simply remind everyone that the Jews are being gathered literally from the four corners, or the far corners of the globe from every nation and every region. The miracle which Hashem promised is being realized and Israel is anything but a European colony, it is the realization of the promise by Hashem, it is that simple. Amongst my friends and acquaintances the most used comment boils down to, “It is about time,” or similar comment. The next most stated idea was, “Wow, somebody finally noticed,” along with, “At last,” or similar sarcastic comment. But most of my friends and associates are relatively to extremely religious Israeli Jews, many from the English-speaking world as well as a good number of native Israelis. The reaction of my social circle was fairly even and supportive of the idea of the United States recognizing Jerusalem as the Capital of Israel and that President Trump added its historic importance as such was an added bonus. This did not alter the opinion of those amongst us who supported Hillary Clinton from still hoping Trump would be charged with some, any form of malfeasance, preferably one worthy of impeachment any more than it changed the minds of his supporters. The reaction in our little corner of Israel is generally that this was wonderful and that it was about time. The most interesting and disconcerting commentaries have been those of the media. They appear claiming that the entire world, particularly the United States, Canada and Europe had best brace themselves readying for waves of Islamic terror attacks. The media have almost amplified the threats that recognizing the three thousand year history of Jerusalem being the Capital City for Israel. What is even more interesting is that Jerusalem has been the capital only of the Jewish people and no other have ever declared any actual importance to Jerusalem and most of the media has all but ignored that. Their specific focus has been to press the criticism that by recognizing a three-thousand plus year old reality, President Trump has painted a target on every American’s back making them specific targets because of his recognizing Jerusalem and starting the moving of the embassy there. We all watched some of the media coverage the other day and it was horrific. Believing the newscast one would believe that all of Israel was ignited in random and terrorist violence and that people were locked into their homes scared to go outside. In our little corner of Israel, not a blade of grass is out of place and life continues on unchanged, unaltered. The days after President Trump made his supposedly universe-altering proclamation appear unchanged from the days leading up to his announcement with only the brighter look on people’s faces and a new vigor in their steps. Have there been violent demonstrations? Sure, as many of you have seen on your televisions as have we. Fortunately, these pictures on your television sets have been the exception, nowhere near the rule. Most lives in Israel remain unchanged, owed much to our blessings. The riotous demonstrations we saw were pretty much restricted to the Temple Mount and Old City neighborhoods as well as Bethlehem and other areas in Gaza, Judea and Samaria and even then restricted to Arab neighborhoods. There have been spotty reports of demonstrations in some of the Arab Israeli Cities in addition to the Arab regions previously reported. None of these were unexpected as Hamas, Hezballah, Fatah, PLO, the PA, and Islamic Jihad had agreed to have three days of rage. Once this had been announced, it really made little difference whether President Trump had made his expected speech as there would have been no stopping the Arab populations from committing to the rioting we have witnessed. One British Newspaper reported a sensationalized “protests sweep Muslim world.” Their reporting noted that possible thousands demonstrated in Amman, Jordan and Cairo, Egypt and a few other large Islamic cities, but the general firestorm had not erupted worldwide as predicted before the announcement. Factually, much of the explosive reactions to President Trump and his earth-shaking announcement have failed to materialize. Check the image below and see the pattern of terror attacks from 9/11 through to sometime in 2015 or 2016. After viewing this image, kindly explain how terrorism could actually be worse. The nation completely covered at the eastern end of the Mediterranean Sea are Israel and Lebanon and the other heavy area is slightly but just as serious as it nearly covers Iraq. There continues to be terror attacks striking inside many of the areas covered by several attacks already as if you live in an area where terrorism had occurred, then those same areas are more likely to be struck by renewed violence. But as far as general mayhem throughout the globe, that will not be occurring. The reality is that the majority of the violence will be restricted to predominantly Islamic regions and neighborhoods. This is both an unfortunate and, in another way, a fortunate result. The unfortunate result is that the Arab and Muslim worlds will erupt into violence over one nation recognizing one of the oldest surviving capital cities, Jerusalem. Let us think about the concept that Tel Aviv is the real capital city of Israel. The nation of Israel is a three-thousand year old concept with her capital as Jerusalem since before 1000 BCE and which existed for a thousand years while Paris, London, Berlin and Washington D.C. were all swamplands or forests, completely undeveloped or, at best, a small village. Not only had Jerusalem existed but was one of the major cities where a number of trade routes interconnected making it an important city. 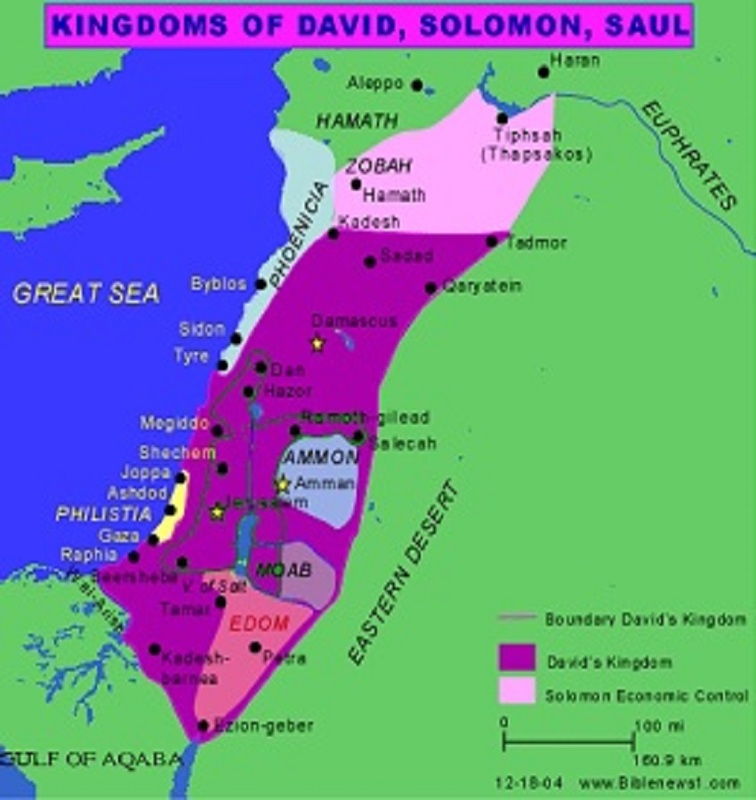 King David was the second King of a united Hebrew, Jewish State who moved the Capital City from Hevron, and Jerusalem remained the capital of the Jewish people ever since. That is over three-thousand years. Jerusalem is mentioned throughout the Jewish Bible, more than any other holy book. The Old City of Jerusalem has buildings older than the United States while the western areas of Jerusalem are a modern and vital city with modern buildings and commodities which leads to quite a vital difference. You have shops from the Shuk with its open booths to a modern three level mall with everything one would expect from a modern mall. Jerusalem is definitely the city where one can find everything, be it old or new, and depicts the difference that is Israel, an ancient land with some of the most amazing and newest innovations and inventions from cell phones to cherry tomatoes. Meanwhile, Tel Aviv was founded on April 11, 1909, which makes it one-hundred-eight and a half years, just a little younger than Jerusalem itself by just over three-thousand years. Quite a disparity and one which really gives Jerusalem and her claim as capital of Eretz Yisroel a slight advantage and we are glad to accept the United States in joining our reality even if it took a controversial President to drag them forward to recognize the past.